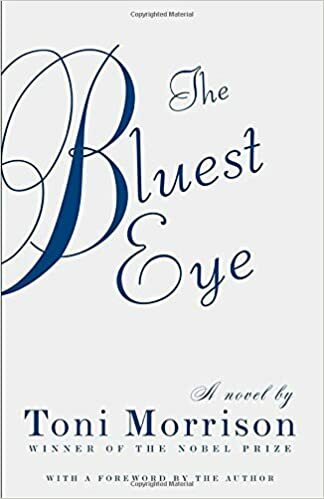 The Bluest Eye – loudlatinlaughing – Euge! Euge! The book is sectioned off into seasons, beginning in Autumn in the aftermath of Pecola’s problems. Claudia has an early rant against dolls and how much she hated getting them as gifts, knowing she was supposed to pretend to be pleased and then sleep with it and pretend to be its mother. “I was physically revolted by and secretly frightened of those round moronic eyes, the pancake face, and orangeworms hair… If, in sleep, I turned, the bone-cold head collided with my own. It was a most uncomfortable, patently aggressive sleeping companion… To see of what it was made, to discover the dearness, to find the beauty, the desirability that had escaped me, but apparently only me. Adults, older girls, shops, magazines, newspapers, window signs—all the world had agreed that a blue-eyed, yellow-haired, pink-skinned doll was what every girl child treasured.” She would then take the doll apart, break its fingers, pop off the head, remove its eyeball. Meanwhile Pecola’s greatest wish is to have blue eyes, and she prays fervently for this, even going to Soaphead Church, a psychic, to get him to bestow these blue eyes on her impossibly black person. In the afterword, Morrison says that this wish was conveyed to her by one of her friends growing up, causing a shock when she realized there was such a thing as racial self-loathing. Author lzPosted on April 18, 2016 October 26, 2017 Categories Toni MorrisonTags YES!